We’re often baffled by why our cats do what they do. But did you ever stop to think that our cats are likely just as confused by human behavior as we are by feline behavior? Humans are frequently doing irritating and irksome things that don’t make sense from a cat’s perspective. The way a cat’s human family interacts with him can influence his trust and comfort level. One cat I worked with, aptly named Scratchy, had a tumultuous relationship with his human family. They loved him and wanted to show him affection, but their actions were causing him to withdraw and act out. He clearly perceived their behavior not as loving and caring but as invasive and threatening. I’ve identified five mistakes Scratchy’s family were making in their interactions with him. In each case, his body language and behavior indicated that he wanted them to stop. But his family missed these clues, because they did not realize that their interactions were making him anxious. Insisting he snuggle with you. Sometimes Scratchy was a willing lap cat; at other times, he would use his claws as weapons in his efforts to escape from his humans. His family never knew when he would be friendly and when he would fight them. But Scratchy’s seemingly unpredictable mood swings had a predictable pattern: He would seek closeness during times when he was able to be near people without being cuddled, hugged or petted. The problems would start when his family would try to force Scratchy to interact with them on their own terms. Scratchy would warn his people that he needed space by swishing his tail or darting away. 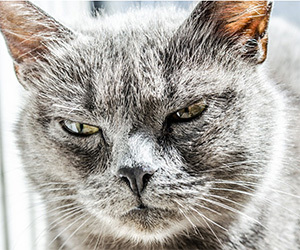 Like Scratchy, many felines experience stress when people force them to interact in a way that feels good to the human but not the cat. Don’t force your cat to snuggle with you, because it’s what you want — you’ll have a better relationship with your cat if you interact in a way that is pleasant for him. Making him play dress up. Scratchy’s family often dressed him in the latest fashions, sometimes using ill-fitting doll clothes. Scratchy wasn’t a fan of playing house or posing for photos in his costumes. Once dressed, he would retreat to the closet or under the bed and hide until someone finally removed the clothes. Some cats can be trained to tolerate or even enjoy short periods of dress up, but doing so takes time and patience — and structured, reward-based training. An easier option is to get your cat dressed for the occasion with something he’s more likely to tolerate, like a decorative collar — or to skip the dress up all together and celebrate with a festive toy. Using human hands as toys. Scratchy was prone to roughly mouthing and scratching hands. This was a direct result of the wrestling-type play his humans engaged in with him, using their hands as toys. Scratchy had inadvertently been taught that human hands are like prey that he could bat, pounce on and grab. This was a real problem, because Scratchy was prone to attacking the hands of groomers and staff at the veterinary clinic, as well as turning on his family when they tried to pet him. Instead of human hands, play is better directed toward designated cat toys. Doing so distinguishes those objects acceptable for the cat’s claws and teeth to dig into versus those objects which are not acceptable. Directing play to toys also helps to reduce confusion over how a human is going to act and how the cat should respond. Scratchy would often retreat under the bed when he was upset or tired. His family thought nothing of pulling him out of his safe space when they wanted to spend time with him, ignoring his outstretched claws. This just intensified Scratchy’s desire to be away from his people. Dragging a cat out of hiding or restraining the cat and forcing him to cuddle or play doesn’t bode well for an anxious cat. Scratchy was much more confident and comfortable when he was allowed to greet people on his own terms. Rather than compelling him to join the party, Scratchy’s family learned to let him venture out on his own. They also looked for ways to entice him to come out from under the bed, using treats, toys and catnip. Finally, I encouraged them to establish a consistent routine for Scratchy’s interactions with people. This included playing with a favorite toy, going to the comfort of his elevated perch for a treat or showing off his favorite tricks for treats, like greeting someone with a high five. Letting kids play roughly with him. Scratchy’s family had three children who would often try to pick him up and carry him around. These interactions clearly scared him; he had learned to avoid the children and became defensive if they came near him. For everyone’s safety, all interactions between a cat and young children need to be supervised and structured. It is important to provide a variety of ways for the cat to escape unwanted attention — I recommended that Scratchy’s family provide a room that would be off limits to the kids, where Scratchy could go when he felt threatened or needed a break. I also recommended that Scratchy’s family put a stop to the children’s efforts to carry him and instead teach them to sit quietly and invite Scratchy to come sit near them or possibly even in a lap. Other fun ways for the children to interact with Scratchy included clicker training and play with a wand toy. Changing the way Scratchy’s family interacted with him made a big difference in their household dynamic. Once his humans stopped acting in ways that made him anxious, Scratchy became the confident, loving cat they had hoped for. It was a win for everyone!